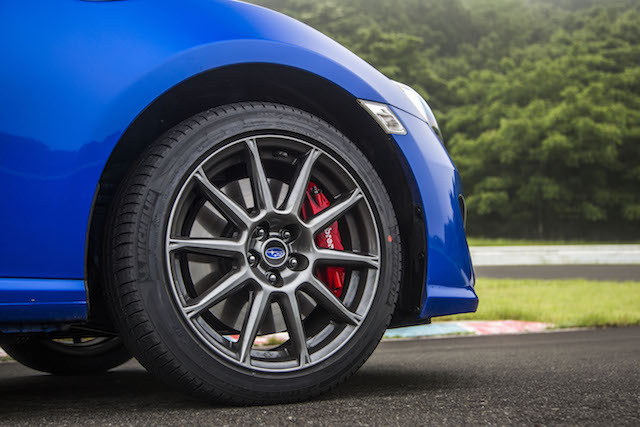 Subaru’s sport coupe receives design enhancements inside and out. As before, the 2017 Subaru BRZ maintains its sports car persona as evidenced by its low center of gravity, modest weight, and deft handling. The main exterior change has everything to do with its standard 17-inch wheels — new aluminum alloy or black alloy designs are rolled out and shod within the summer (performance) tires. Also new are automatic on/off LED headlights with height adjustment. Choose the Limited edition (Premium is standard) and this model gains LED fog lights. Also apparent is new body color fender garnish with a black insert. A fuel tank undercover insulator is standard and the aluminum trunk spoiler is painted to match the body’s color and includes black finish. The available performance package — manual transmission model only — comes with black alloy wheels, Brembo 4-wheel disc brakes and calipers, and Sachs Performance shock absorbers at all four corners. Floor and fuel tank undercover insulators are included. Inside, the center dash panel trim is dressed in simulated leather and offers red stitching. Matching the design is the leather-wrapped steering wheel with audio and Bluetooth controls. Choose the Limited edition and your BRZ also adds a door trim lower knee pad with simulated leather with red stitching and bright silver trim. This model now comes with an instrument cluster meter visor with simulated leather accented by red stitching. Those accents extend to the front seat backs and to the shift lever boot. The sport design instrument cluster now has a 4.2-inch color multi-function display. 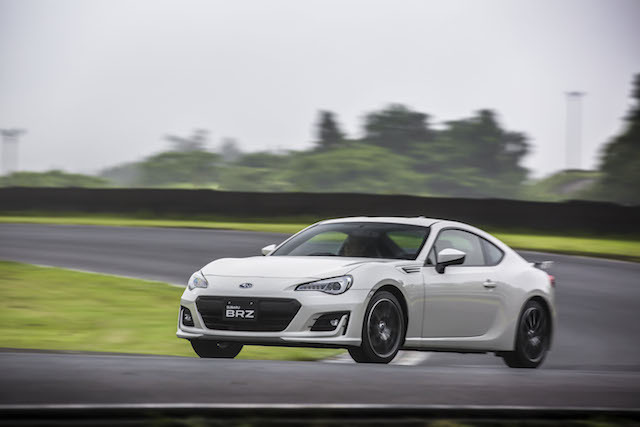 As before, the Subaru BRZ is powered by a high-performance 2.0-liter, BOXER four-cylinder engine. This motor makes 200 horsepower (205 horsepower with the manual) and has an output of 151 foot-pounds of torque (156 foot-pounds with the manual). A 6-speed manual transmission is standard; a 6-speed automatic is available. The automatic also makes available steering wheel paddle shifters and replaces the previous sport mode with a track mode to go with the standard normal and snow modes. Helping the enhancements to justify the track mode are the updated coil springs and dampers as well as the now larger rear stabilizer bar. 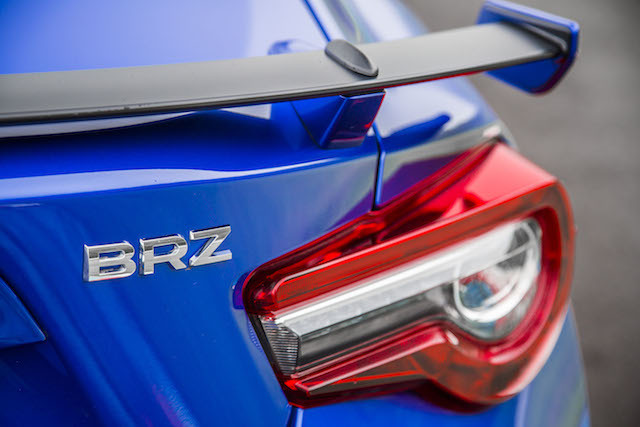 Additional body updates have increased the BRZ’s rigidity. Downshift blipping control also returns this year and vehicle stability control is now standard across the model line. As before, a Torsen limited-slip differential returns. Finally, a lower final drive ratio from 4.1 to 4.3:1 improved acceleration on manual transmission-equipped models. The Subaru BRZ sells in small numbers, typically 400 to 500 per month. This year, sales are down by 14.3 percent, reflecting a greater trend toward pickup trucks and utility vehicles. Nevertheless, Subaru is sticking with its sports coupe, a model also sold as the Scion FR-S. However, the FR-S is in its final year and will yield a 2017 Toyota 86 model this fall. See Also — Scion FR-S: Attainable Fun! Photos courtesy of Subaru of America, Inc.